For Sophie Simmons, collaborating with other artists is a rewarding experience. She gets to test the waters with different genres, experience recording in places around the world and be a part of successful team efforts. However, she got to a point in her songwriting where she would leave the studio with a song she felt only she could sing. One of those songs was “Black Mirror”. The concept of “Black Mirror” stemmed from a binge-watching session of the Netflix show of the same name. The show revolves around the impact and consequences of technology in modern society, from extreme to more realistic instances. It sparked a discussion for Simmons on her relationship with her phone and how it was more consistent than the relationships of even those closest to her. Instead of focusing on a pop song about a romantic relationship, she decided to touch on relationships with technology. Although “Black Mirror” is her first solo single, she has been featured on songs by Yellow Claw, The Galaxy, Cesqeaux and Rytmeklubben. Through these opportunities she has been able to stretch her imagination as a songwriter and focus on what she wants to accomplish both personally and with others. Her to-be-released album focuses on a common theme of perspective, taking the listener on a journey that is quite different from most albums. Simmons believes there’s a common theme in pop songs that the narrator has been done wrong and they’re going to be a better person because of it - but that isn’t always how the world works. Instead, she has the narrator take responsibility for their actions and instill more relativity and human connection. Her perspective not just on her album but on her life has positively impacted the way she sees the world these days. 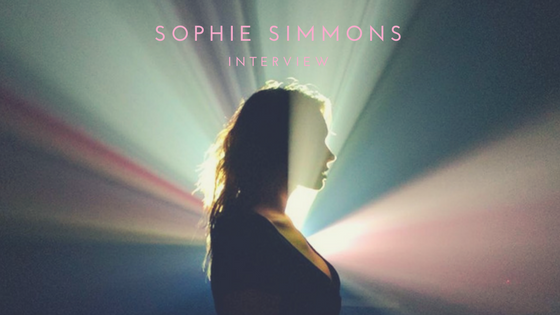 Sophie Simmons has come a long way from her first songwriting sessions in her early teens - she now has the background and the backbone of a strong, independent songwriter with equally strong vocals. She also uses flight mode on her phone way more often.